Eye: A pretty and polished copper coin color. Nose: Aromas of succulent fresh fruit, flowers, spice and damp earth. Palate: Palate entry has a nutty opening taste, then at mid-palate there’s an expanding profile that includes oaky vanilla. Palate entry is slightly off-dry, with a caramel-like and oak taste. On the mid-palate, the flavor deepens, offering silky tastes of light toffee, almond, butter and vanilla extract. The Pasquet Bernadette Cognac is one of two tributary Cognacs created to honor an influential figure. 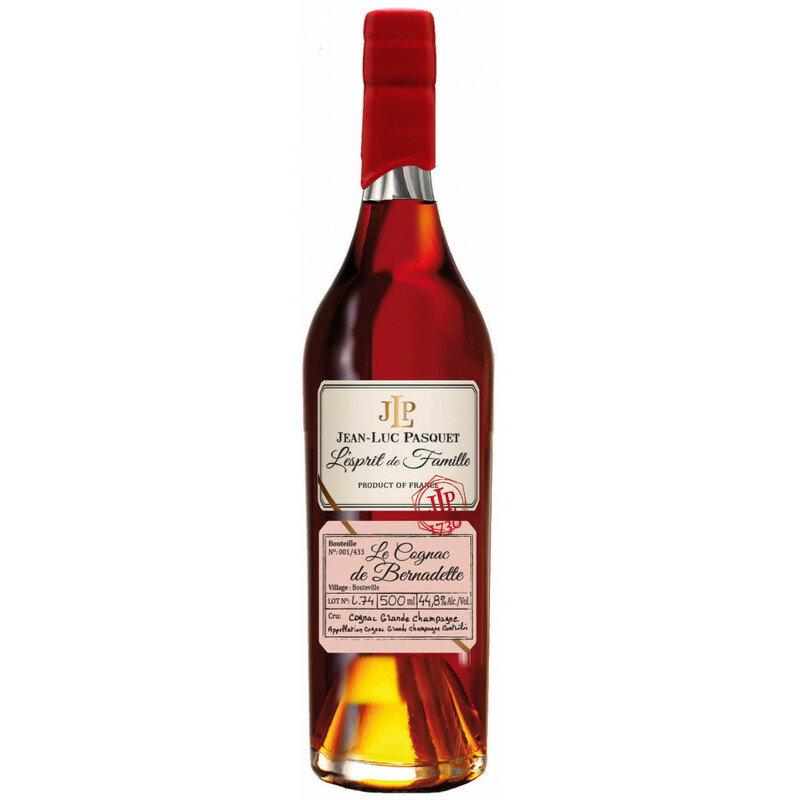 Bernadette Grimaud, the inspiration behind this Cognac, took over her father’s Bouteville vineyards of the Grande Champagne cru in 1974. This bottle contains a cask of the same eaux-de-vie that she distilled from her very own grape harvest that very year. Bernadette was a figurehead for women in the world of Cognac, and the mark that she made remains in the finesse of this bouquet. This Grande Champagne blend is a very elegant and nuanced Cognac, with plenty of style and grace. With Ugni Blanc grapes harvested by hand and fermented using native yeast, it was distilled in her 15 hectoliter pot still, to then be matured in a single barrel until 2018 to be enjoyed in the here and now. This remarkable Cognac is worthy tribute to a pioneering individual. As with all of Pasquet Cognacs, careful handmade craft is the essence of this Cognac house, and of the Bernadette. The Pasquet Bernadette arrives in a slim, classic bottle with a ruby red seal, and the powder pink labeling denotes the artisan craft of this house. It is created in conjunction with the Pasquet Jean Cognac, which was also blended as a tribute. It differs however, with its blue label. Take a look at our blog to find out more about the family values of the Pasquet Cognac maison here.